My last post was a veggie pizza and this post is a pizza swirl bread. Now don’t get me wrong, yes I do love pizzas but can’t have it everyday. 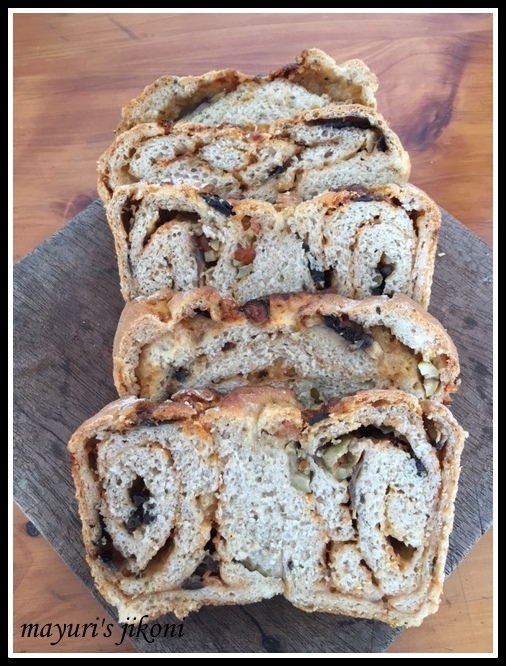 Pizza Swirl Bread was the May challenge for the We Knead to Bake set by fellow member Niv Mani of Panfusine. Niv wanted us to use the recipe for the dough and the filling and sauce was our choice. This time I managed to bake it a few weeks ahead but I was not happy with the result. It baked well but because of the twists, the bread was not slicing well. However, hubby really enjoyed the bread with an olive dip. Usually my bakes turn out good so it really bothered me that this loaf didn’t turn out so nice. So the bread was still on my ‘must do list’. I managed to bake it again yesterday and was happy with the end result. Nice crusty loaf and good slices. Though the baked loaf does not look pretty, the slices looked really good. Each slice has a different pattern. This bread can be served with a soup, a salad or eaten on its own. A healthy option for a snack and its like having a pizza but without too much cheese. So here’s the recipe. Do try it out. It is delicious and not too difficult to make. I decided to use more wheat flour and less plain flour in my dough recipe. The first time I used onion slices and corn as my filling and the second time round I used mushrooms and olives. Sift both the flours together into a big bowl. Add salt, yeast and sugar.Mix well. Dust the worktop with flour. Knead the dough on the worktop for 5-10 minutes till its smooth, soft and elastic. Grease the bowl with oil. Smear little oil over the dough and put it into the bowl. Cover the bowl with cling film or a tea towel. Put the bowl in a warm place for the dough to rise for 1½ hours or till its double the size. While the dough is rising, prepare the sauce. Add onion and saute till its soft. Cover the pan and let the sauce cook over low heat till it becomes thick. Once its thick, take the pan off the heat. Add pepper and herbs and mix well. Dust the worktop and form the dough into a ball. Roll it out into a rectangle 18″ X 10″. It should be about ½” thick. I placed the rolled dough with longer length across and the shorter side facing me. Scatter the cheese over the sauce. Now scatter the mushroom slices and olives. Make sure the cheese and filling is evenly distributed over the rolled dough. Roll up the dough, like a swiss roll. Pinch the seams to seal and tuck in the ends. Now with the long side across the worktop, form a u shape from the middle. Take the right side and place it over the left. Continue to form the twist. Pinch the ends and tuck. Place the twisted dough in a greased loaf tin 9″ X 5″. Cover the dough with a tea towel. Let the dough rise again in a warm place for 45 minutes. Brush olive oil over the top of the risen dough. Bake the bread for 35-45 minutes or till the top is golden brown. Take the loaf out of the oven. Leave it in the tin to cool for 10-15 minutes. Take it out of the tin and place it on a wire rack to cool completely. Serve with soup, salad or with an olive dip. Don’t add to much filling, and don’t pile it all in the middle. Grease the loaf tin properly. You don’t want it to get stuck in the tine. Wait patiently for 10 to 15 minutes before you remove the loaf from the tin. Use any filling that you like. First time I had used 1 cup sweet corn and ½ cup sliced onion. If you roll out the dough too thin, it will tear when you try to twist it. So make sure its about ½” thick. Thanks Jolly, it was a truly wonderful loaf.